Collectors Teddys with much love for detail. Be aware: The prices are the prices we know right now up to Brexit. After Brexit, prices could be changing due to extra taxes etc. We don't know how Brexit will affect the prices of Charlie Bears and extra cost because of the Brexit will be calculated in the prices of the bears. Reservations before 1st of June will keep the original price we know now. 2017 Charlie Bears Botticelli Isabelle collection, 41cm. 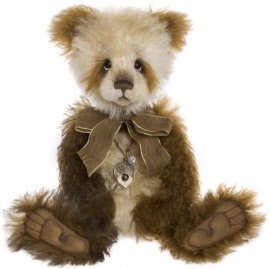 Named after the Florentine Painter, BOTTICELLI is an amazing standing bear and will make an impression with his long, wavy purple and ivory coloured mohair fur, hand-stitched nose and panda shading around the eyes. He looks very proud of himself, as he stands unaided, wearing his big key pendant. He comes in an embroidered Isabelle Collection canvas bag. Collectors item and not suitable for under 14 years of age. 2016 Charlie Bears Cassie Minimo collection, 20cm / 8". Cassie Minimo is a fully-jointed, miniature mohair & alpaca dog from the Charlie Bears 2016 Minimo Collection. His colours are black and white. He has an embroidered nose and a necklace with tiny bone. 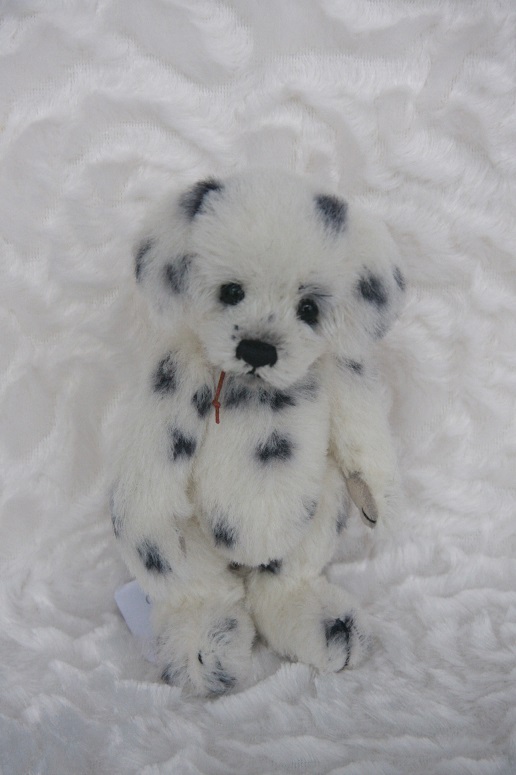 2016 Charlie Bears Polka Dot Minimo collection, 20cm / 18". Polka Dot Minimo is a fully-jointed, miniature mohair & alpaca dog from the Charlie Bears 2016 Minimo Collection. His colours are black and white. He has an embroidered nose and a necklace with tiny bone. 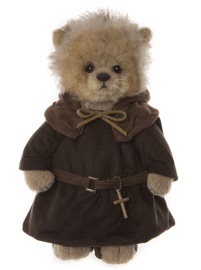 2018 Charlie Bears Isabelle collection Trinity, 46cm. TRINITY is a very stylish and sophisticated lady and is made from a mix of luxurious alpaca and mohair. The fur on her head is a soft cream and her shaved muzzle shows off her dark twinkling eyes, while the dark hand-stitched nose makes a great contrast against the light fur. 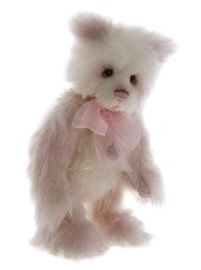 The pale pink fur has lots of deep pink tipping to add depth, giving a really great effect. The paw pads have been sculpted and stitched and also heavily airbrushed to make the pads stand out. The floral and lace accessories around her neck and on her right ear are really intricate and finish the look of this special bear to perfection. Each bear comes in an embroidered Isabelle Collection canvas bag. 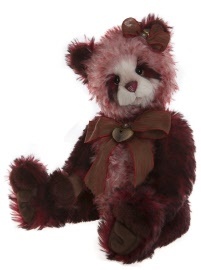 2018 Charlie Bears Isabelle collection Arabella, 43cm. 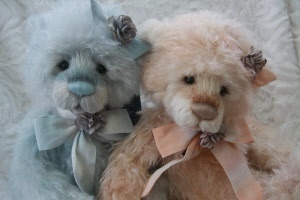 If you like girly bears, then ARABELLA could be the one for you. She is made from a mix of luxurious alpaca and thick curly mohair, in shades of peach and winter white and looks really cuddly. The muzzle has been shaved and given some peach airbrushing for definition. 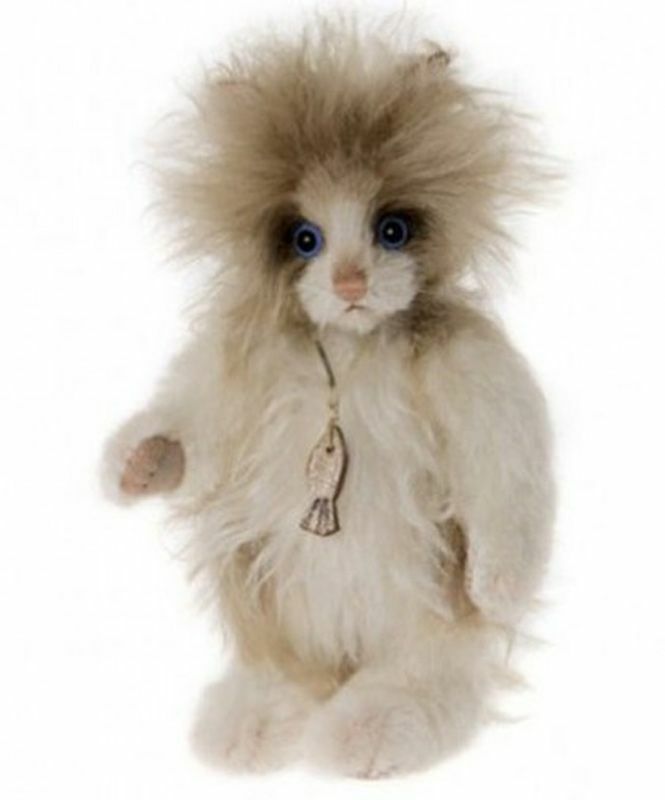 She has a hand-stitched nose and ultrasuede, sculpted and stitched paw pads, famously known as 'Tickly Toes!'. She looks very glamorous with a large peach pastel bow around her neck, adorned in the centre with a peach flower and she wears a smaller bow to match on her right ear. 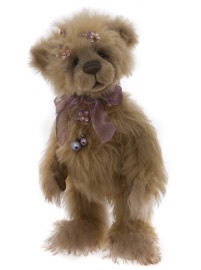 2018 Charlie Bears Isabelle collection Millicent, 43cm. If you like girly bears, then MILLICENT could be the one for you. She is made from a mix of luxurious alpaca and thick curly mohair, to give a really cuddly look and the muzzle has been shaved and given some blue airbrushing for definition. 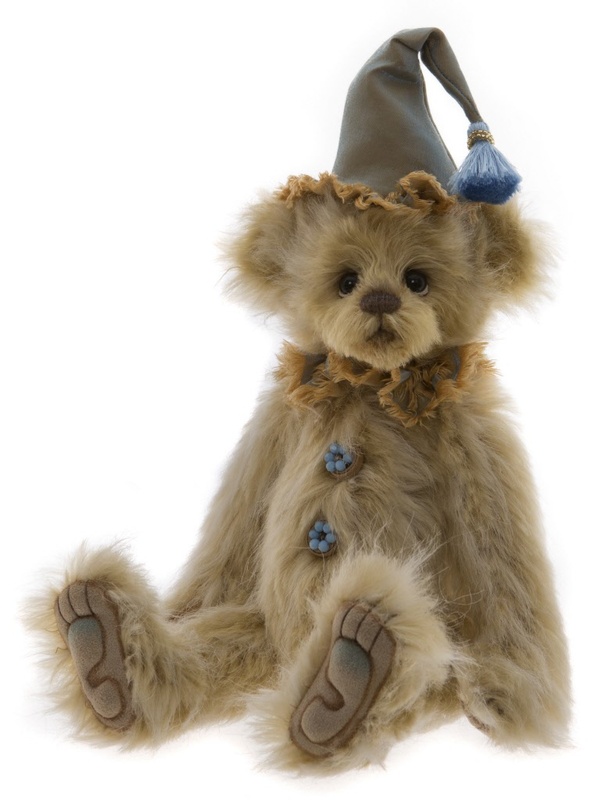 She has a blue hand-stitched nose and ultrasuede, sculpted and stitched paw pads, famously known as 'Tickly Toes!'. She looks very glamorous with a large blue pastel bow around her neck, adorned in the centre with a blue flower and she wears a smaller bow to match on her right ear. 2017 Charlie Bears Forbes Isabelle Collection, 42cm. Limited edition of 400 pieces. 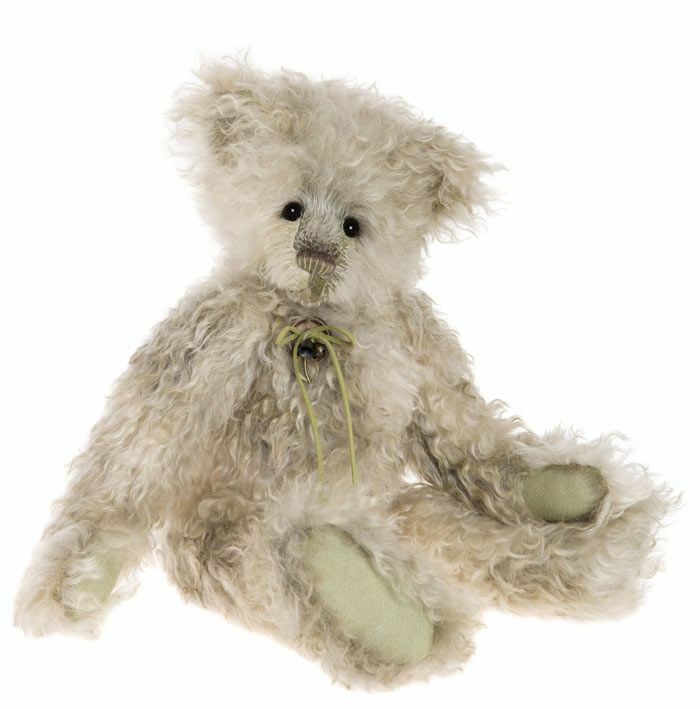 FORBES is a lovely gentle looking bear, made from sumptious long-pile mohair, in shades of green and cream. 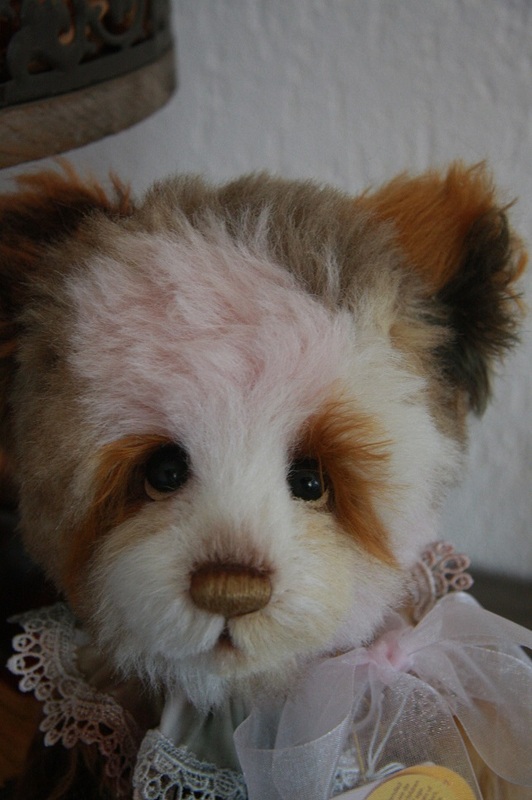 She has a two-tone handstitched nose, with big expressive eyes and nice sculpted pawpads. She wears a pendant with heart and bell. She comes in an embroidered Isabelle Collection canvas bag. 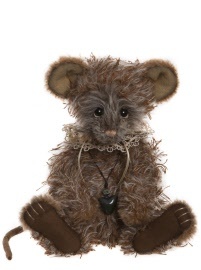 2017 Charlie Bears Leonardo Isabelle Collection, 45cm. Limited edition of 350 pieces. Named after the great Leonardo Da Vinci, LEONARDO bear is going to go out to get some inpiration for his next work and has got his lovely scarf on to keep warm, which was modelled after one of Charlies favourites. 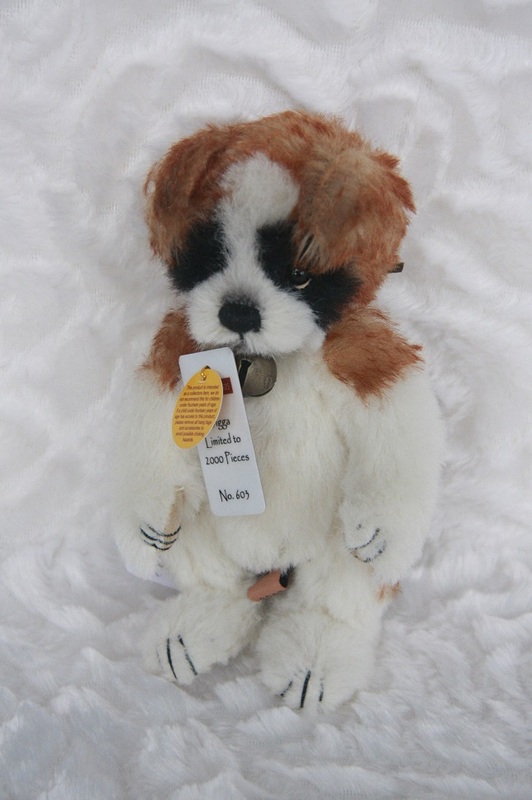 He stands out from the crowd with his apricot and cream coloured mohair fur. His two tone, hand-stitched and waxed nose compliments his colouring and he has dark twinkling eyes. A great free standing bear with flat feet, ready to walk into your hug. Leonardo comes in an embroidered Isabelle Collection canvas bag. 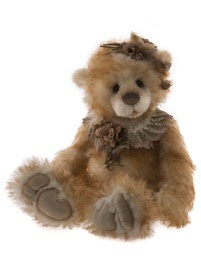 2018 Charlie Bears Tennison Isabelle Collection, 51cm. Tennison is a very beautiful panda style Teddy in the 2018 collection. 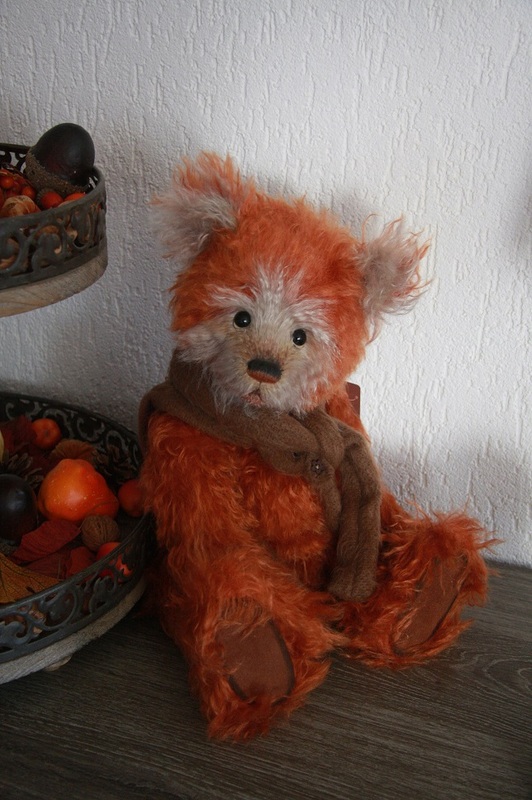 She is made from wavy mohair in shades of brown, cream, ginger etc. and has a deep brown hand-stitched nose with some airbrushing above. She has lovely sculpted pads and wearing a bow and necklace with several pendants. Tennison comes in an embroidered Isabelle Collection canvas bag. 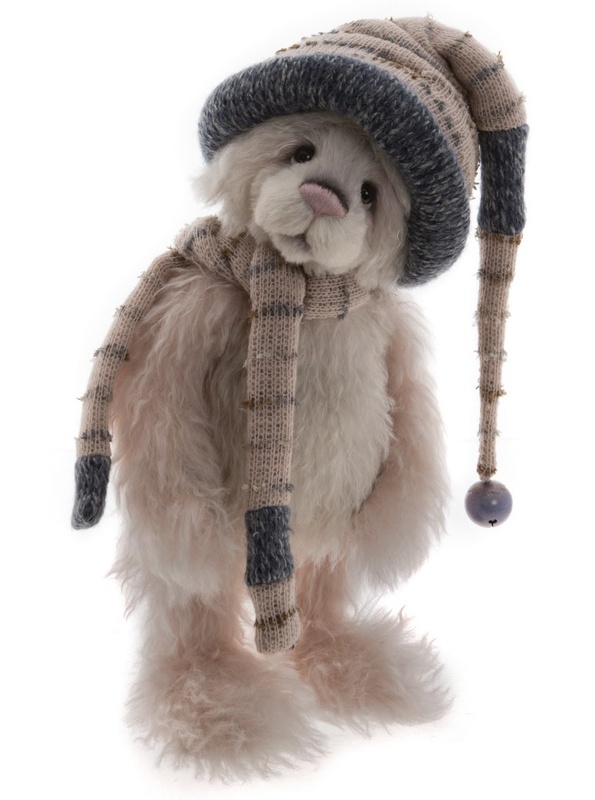 2017 Charlie Bears Mohair Year Bear Isabelle Collection, 40cm. 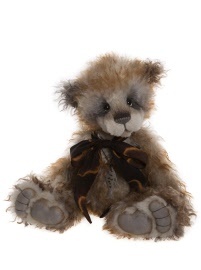 This bear is personally selected by Charlie each year and this years bear is a very colourful bear in lovely shades of brown, copper and all kinds of matching colours. It makes her a wonderful panda style Teddy. 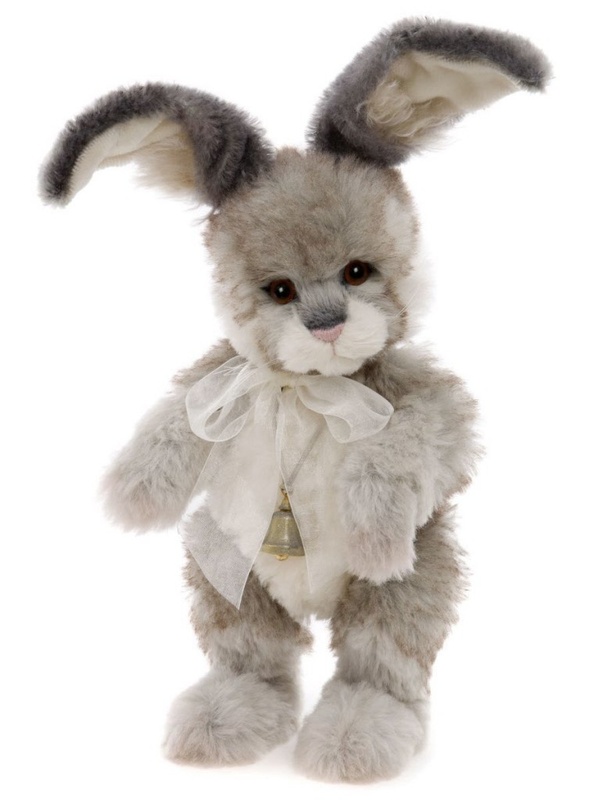 She has a hand-embroidered nose, white under the eyes, to give that "who me" look, stands un-aided and is finished with a frilly collar and organza ribbon. She comes in an embroidered canvas bag. 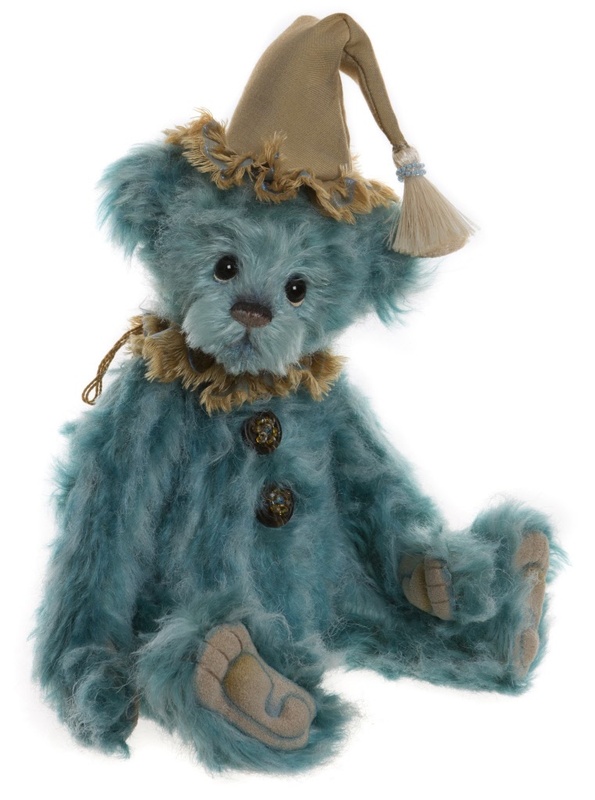 2017 Charlie Bears Dempsey Isabelle Collection, 51cm. This is Dempsey a handsome large bear which is fully jointed and has a wonderful feel to him from the weight which is added. 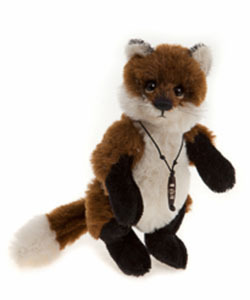 He is loosely jointed so can be positioned in a variety of poses once home in his new hug. He has been made using a soft mohair in a muted shade of pale olive and has an overstitched hand embroidered nose. 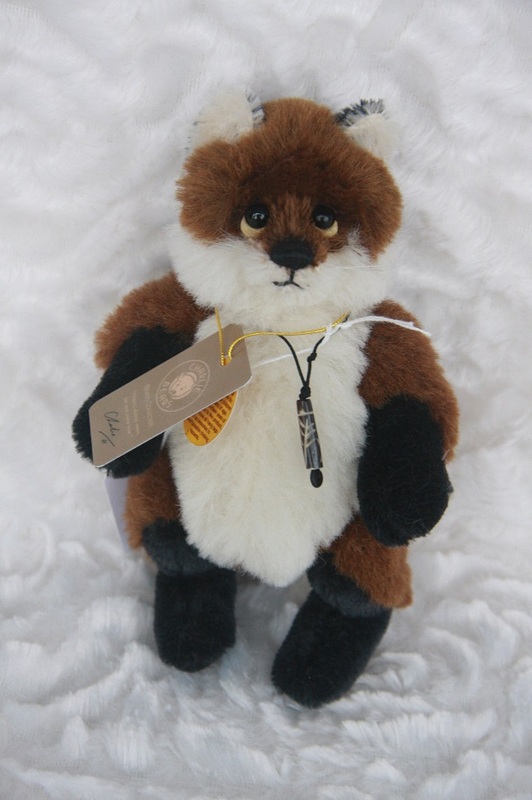 He has soft paw pads and a small button and string tie as his accessory. He comes in an embroidered canvas bag. 2017 Charlie Bears Michelangelo, 48cm. Michelangelo, a very special mohair bear from the Isabelle collection. 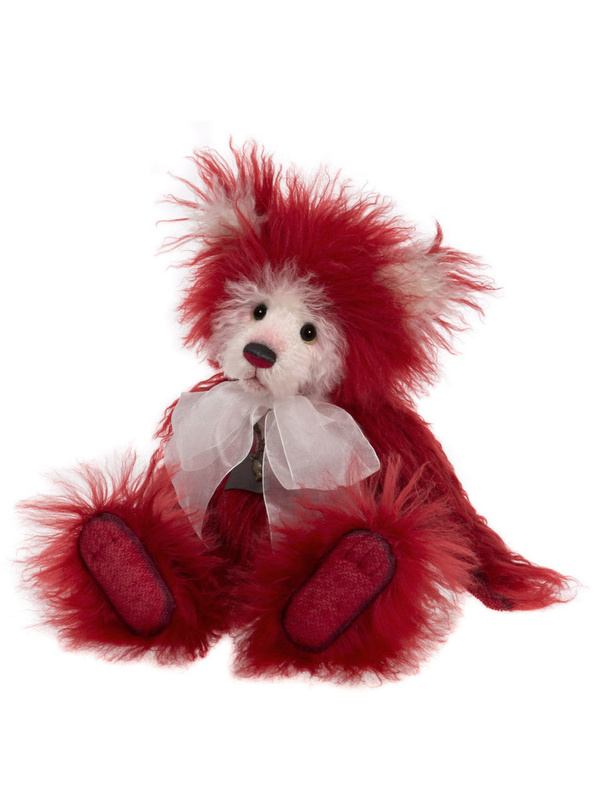 Created in a vibrant red Mohair this little character is surely one that cannot be missed! A contrasting soft white mohair has also been used to form his face and inner ears and he is loosely jointed so he can be easily achieve many different positions when displayed within his new hug. A soft canvas has been used to create his paw pads which have additional toe detailing. His hand embroidered nose has been accentuated by airbrushing and a light coat of wax. His flamboyant accessories include both a ribbon bow and necklace. 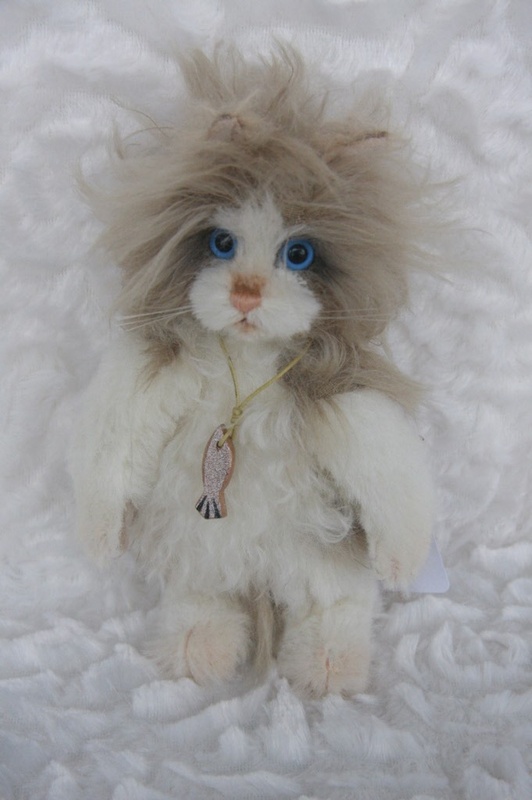 2015 Charlie Bears Boss Cat, 20cm / 8". 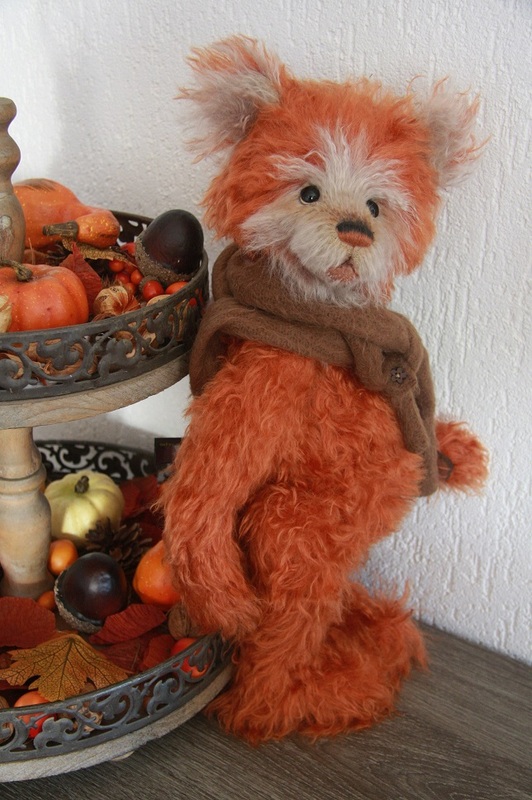 Boss Cat Minimo is a fully-jointed, miniature mohair & alpaca cat from the Charlie Bears 2015 Minimo Collection. He was made for the best friends club members. His colours are cream and white. He has an embroidered nose and a necklace with tiny fish. 2019 Charlie Bears Bozo Isabelle Collection, 30cm / 12". could not resist including a new duo for this years collection. been added to his chest and tummy to complete his look. to collect in sets) is called Pinto. Comes in a Brown Embroidered Canvas Isabelle Collection Bag. 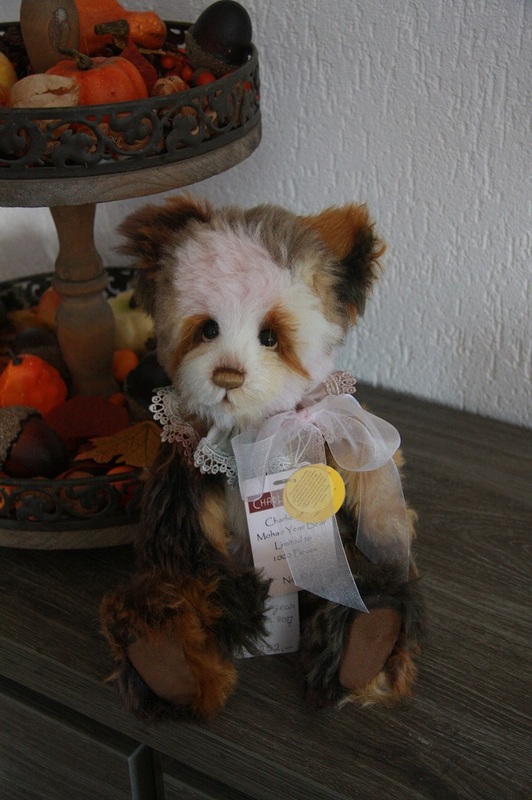 2019 Charlie Bears Carmen Isabelle Collection,53cm / 16.5". chest. Carmen has flat paw pads so able to stand unaided. Her hand tied ribbon bow and necklace complete her look. Desdemona, Ophelia, Madam Butterfly and Tatyana. 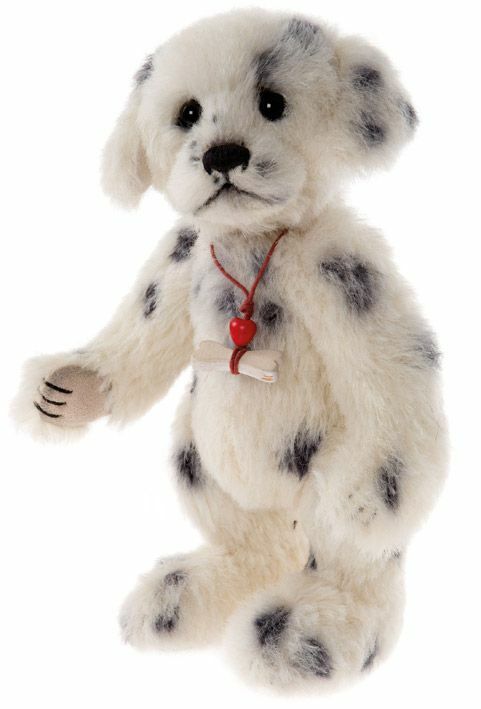 2019 Charlie Bears Feta Isabelle Collection, 28cm / 11". collar and small pendant necklace added for her accessories. complete this mousey set are called Mozzarella and Halloumi. 2019 Charlie Bears Flamenco Isabelle Collection, 46cm / 18". Foxtrot created from the finest Schulte mohair and alpaca. deep set glass eyes and a new styled overstitched nose detail. ribbon bow strung together by a button and pendant detail. 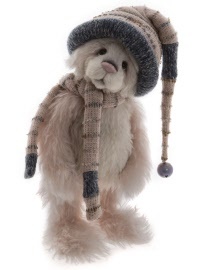 2019 Charlie Bears Mohair Year Bear Isabelle Collection, 37cm / 14.5'. 2019 Charlie Bears Robin Hood and his Merry Man part 4 Friar Tuck Isabelle Collection. pre order possible for the set of 4.
in soft country browns, mushroom whites and pale yellows. character. He has deep set brown glass eyes, and is softly filled. also been given a friars habit and cross as his accessories. in a newly designed folklores and fables presentation box. Hood, Will Scarlet, Little John and Friar Tuck. 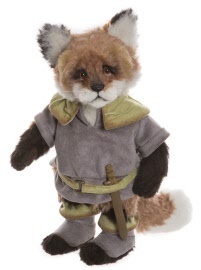 Robin Hood and his Merry Men are only available as set of 4: Robin Hood, Wil Scarlet, Little John and Friar Tuck. 2019 Charlie Bears Halloumi Isabelle Collection, 28cm / 11". that complete this mousey set are called Feta and Mozzarella. 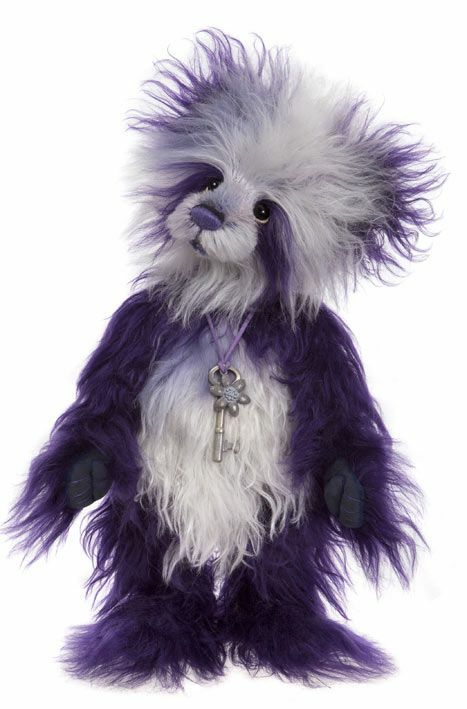 2019 Charlie Bears Isabelle Masterpiece 2019 Isabelle Collection, 52cm / 20.5". and will arrive with a bespoke collectors canvas bag. 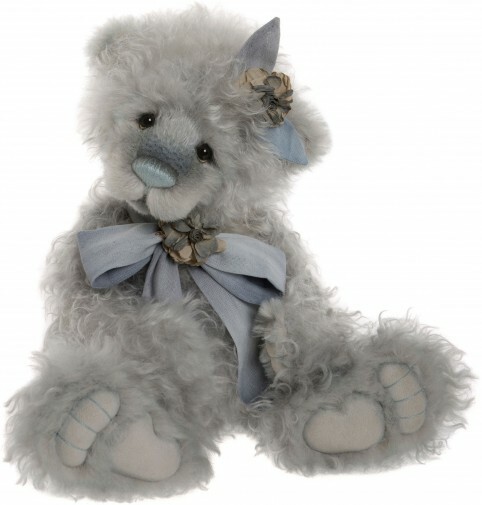 2019 Charlie Bears Je 't Aime Isabelle Collection, 61cm / 24". arrive with a bespoke collectors canvas bag. 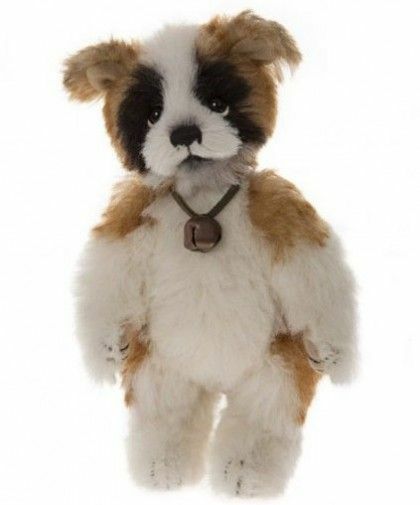 2019 Charlie Bears Kennedy Isabelle Collection, 43cm / 17". embroidered overstitched nose and additional airbrushing . 2019 Charlie Bears L'Amour, 61cm / 24". eyes, a hand embroidered nose with additional wax detailing. She has both a lace tie dyed bow and necklace accessories. 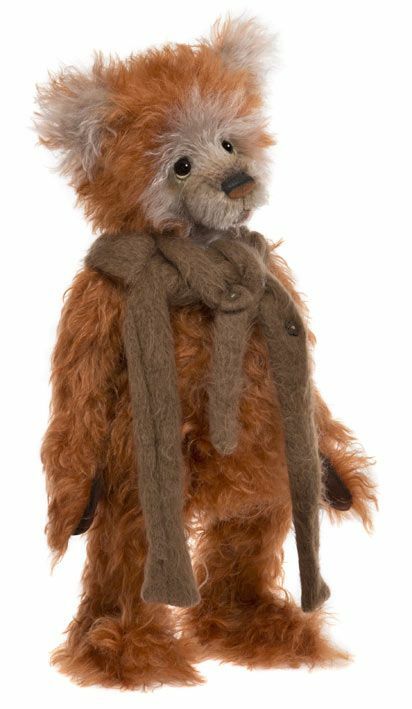 2019 Charlie Bears Little John Isabelle Collection, 34cm / 13.5". Be aware: collectors who order the set of 4 go first in the order list. 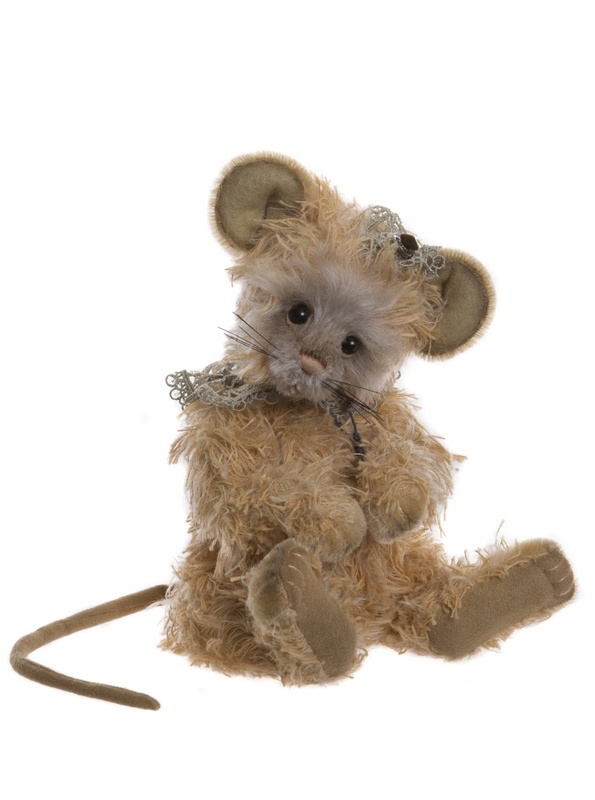 2019 Charlie Bears Mozarella Mouse Isabelle Collection, 28cm / 11". that complete this mousey set are called Feta and Halloumi. 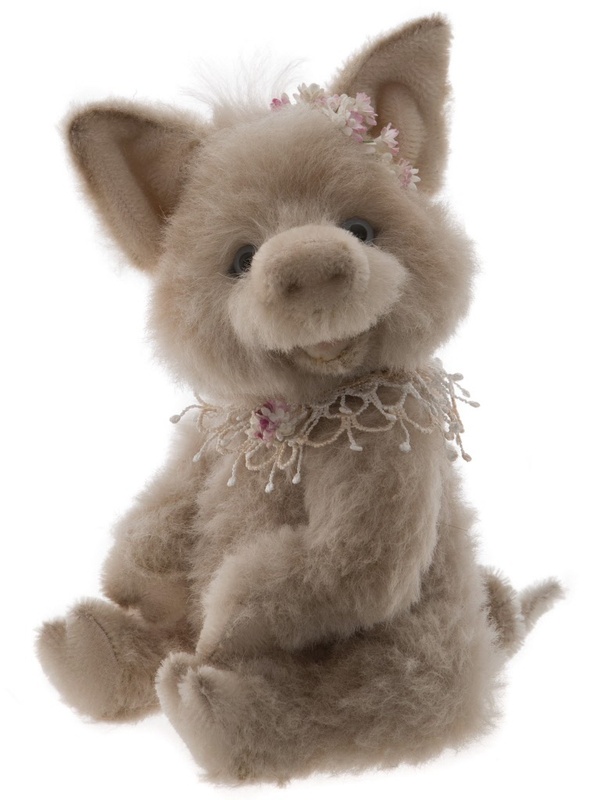 2019 Charlie Bears Petal Isabelle Collection, 28cm / 11". created a special bunny pairing for our mohair collection. 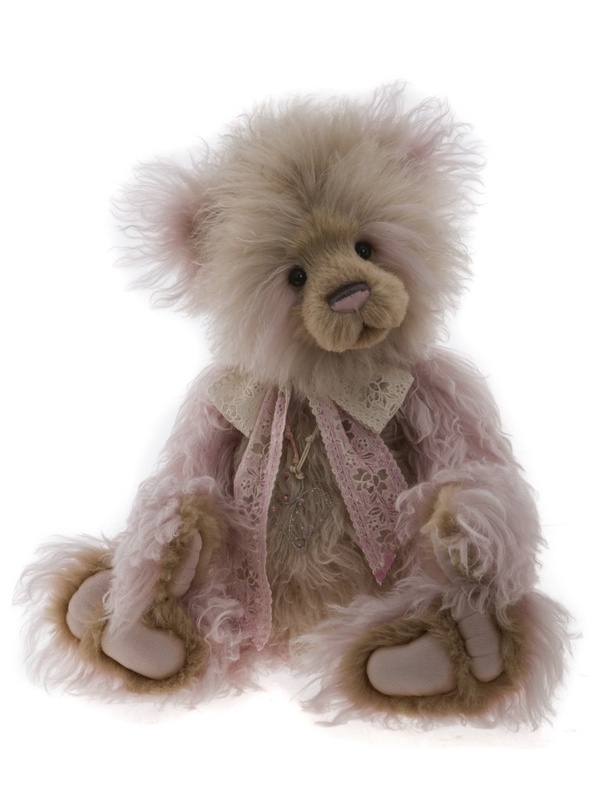 2019 Charlie Bears Pinky Isabelle collection, 25.5cm / 10". snuggled up in a special canvas collectors bag. 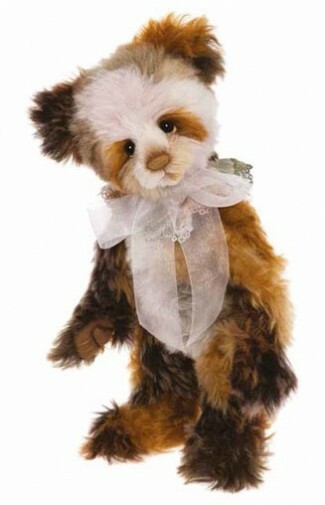 2019 Charlie Bears Pinto Isabelle Collection, 30cm / 12". Charlie Bears ‘Who me?’ look and a tiny handsewn nose. 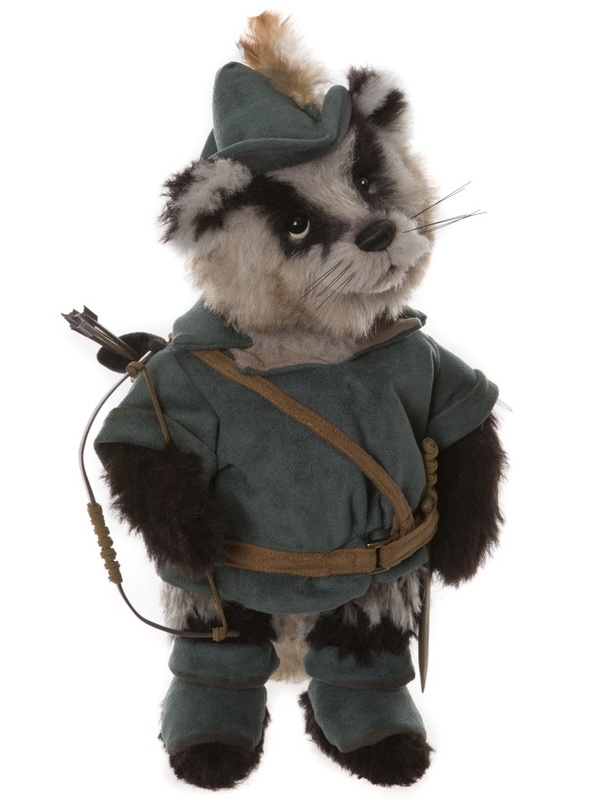 2019 Charlie Bears Robin Hood Isabelle Collection, 33cm / 13". Only in set of 4. 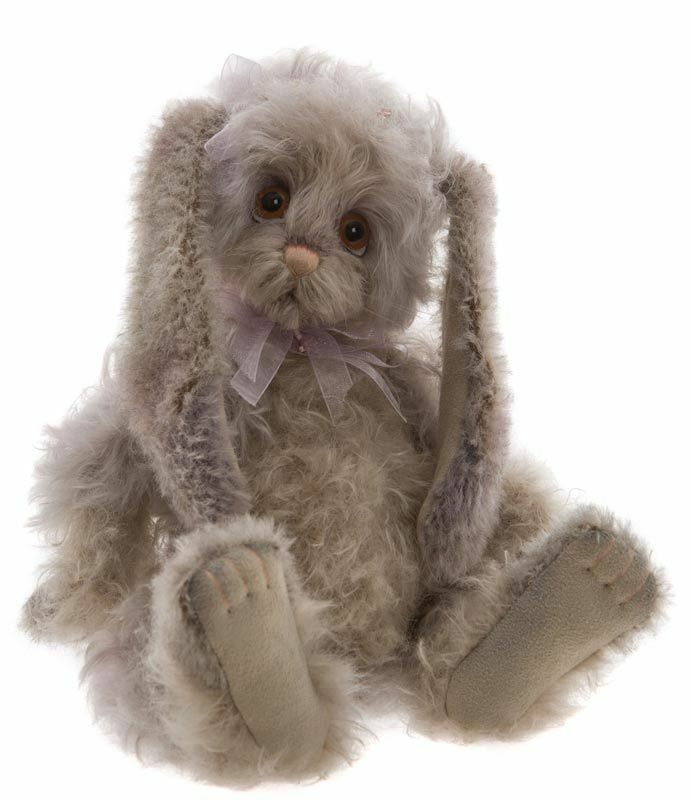 2019 Charlie Bears Tatyana Isabelle Collection, 42cm / 16.5". Sold out / Fully pre-ordered. Madam Butterfly and her lovely sister Carmen. 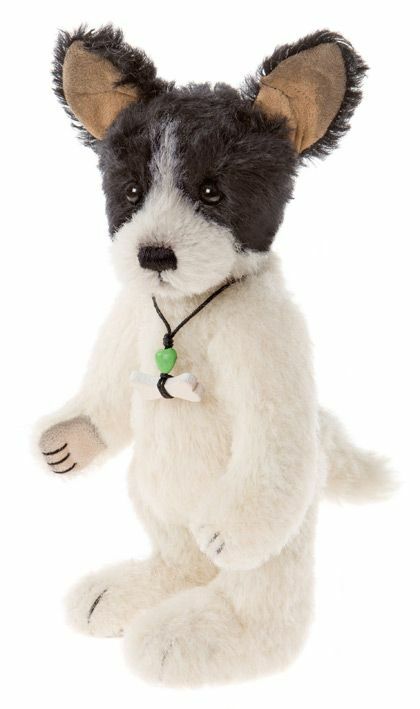 2019 Charlie Bears Toastie Isabelle Collection, 44.5cm / 17.5". in a selection of porcelain whites and ballet slipper pinks. 2019 Charlie Bears Will Scarlet Isabelle collection, 28cm / 11". pre-order possible (set of 4 only). Only available as set of 4. 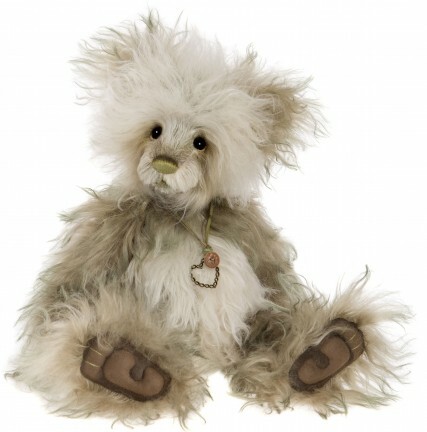 2015 Charlie Bears Scampeteer Minimo Collection, 17cm / 6.5". 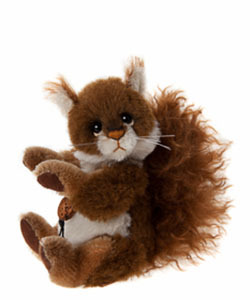 Scampeteer Minimo is a fully-jointed, miniature mohair & alpaca squirrel from the Charlie Bears Minimo Collection. His colours are brown and white. He has an embroidered nose and a necklace with bread. 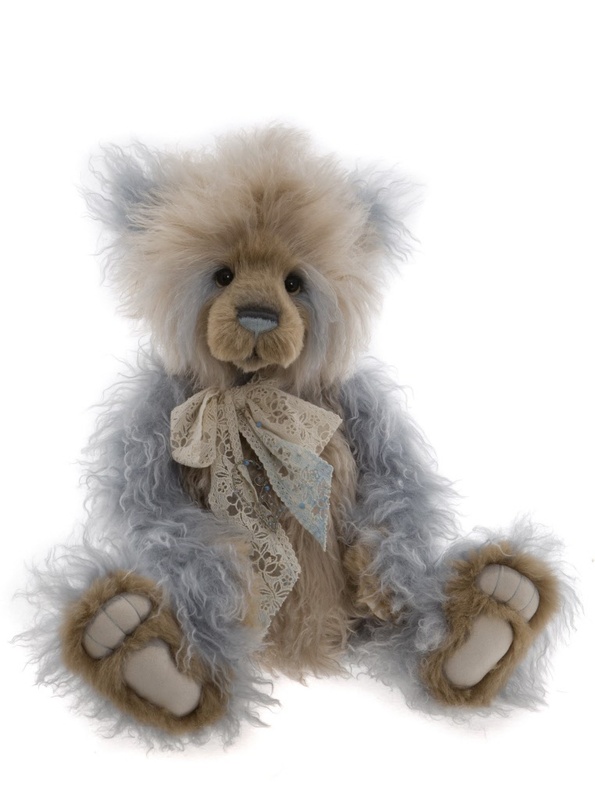 2015 Charlie Bears Pitter Patter Minimo Collection, 17 cm / 6.5". 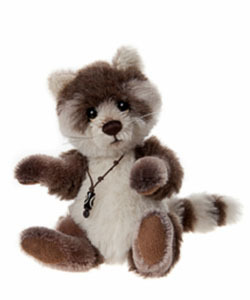 Pitter Patter Minimo is a fully-jointed, miniature mohair & alpaca Raccoon from the Charlie Bears Minimo Collection. His colours are brown, grey and white. He has an embroidered nose and a necklace. 2015 Charlie Bears Townend Minimo Collection, 18cm / 7". 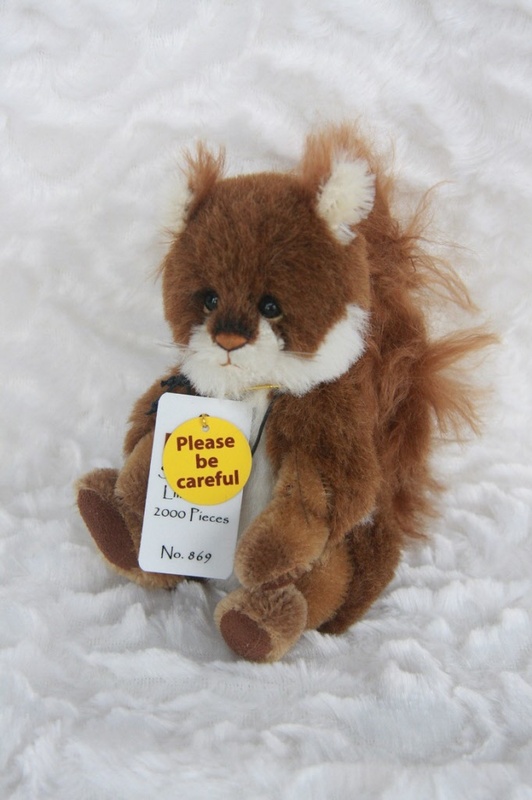 Townend Minimo is a fully-jointed, miniature mohair & alpaca fox from the Charlie Bears Minimo Collection. His colours are brown, black and white. He has an embroidered nose and a necklace. 2016 Charlie Bears Digga Minimo Collection, 20cm / 8". Digga Minimo is a fully-jointed, miniature mohair & alpaca dog from the Charlie Bears Minimo Collection. His colours are brown, black and white. 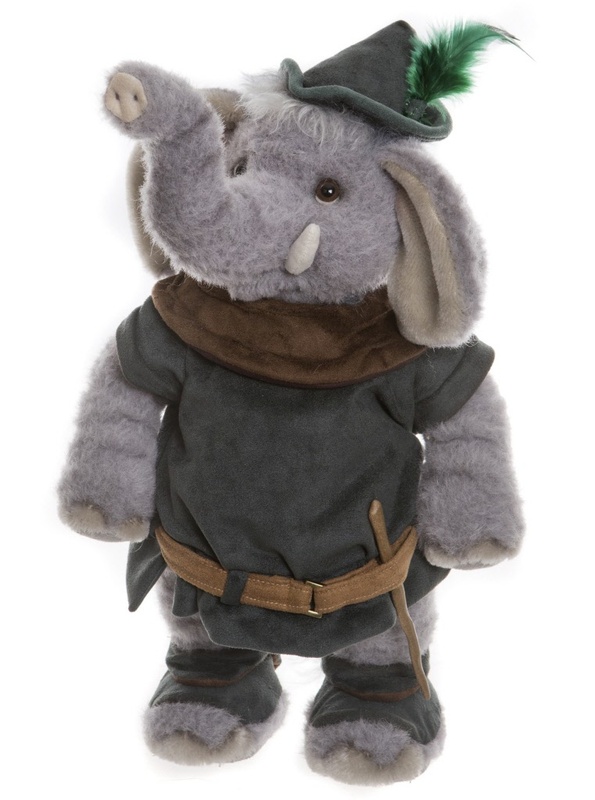 He has an embroidered nose and a necklace with bell. 2017 Charlie Bears Fairylights, 17cm / 6.5". 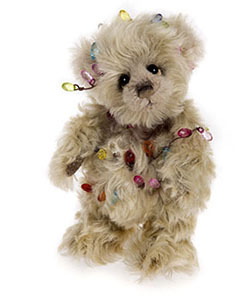 Fairylights Minimo is a fully-jointed, miniature mohair & alpaca bear from the Charlie Bears Minimo Collection and comes from the Wintery Tales Collection. His colours are cream. He has an embroidered nose and is decorated with tiny shiny lights. 2017 Charlie Bears Span Isabelle Collection, 33cm / 13". Span is a fully-jointed, mohair with alpaca Rabbit from the Charlie Bears Isabelle Collection. Her colours are grey and white. She has an embroidered nose, a ribbon and a necklace with bell. She can stand on her own feet. Each Isabelle Collection bear comes in a bag. 2017 Charlie Bears Billy Goats and Gruff, 42cm/37cm/29cm/26cm. 17"/15"/ 12"/10". The troll is called GRUFF and the tones of his thick multi-coloured brown fur are complimented by the dark fur on his paws and feet. 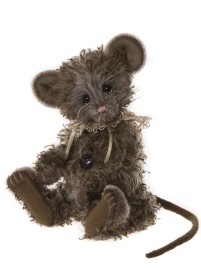 He has an oversized hand-stitched nose,huge amber eyes and two tiny teeth that peek out from his mouth. He wears an autumnal coloured tunic, that looks like layered leaves. This amazing set is not to be missed and will be highly collectable, especially at the limitation is so low, at only 200 worldwide!! 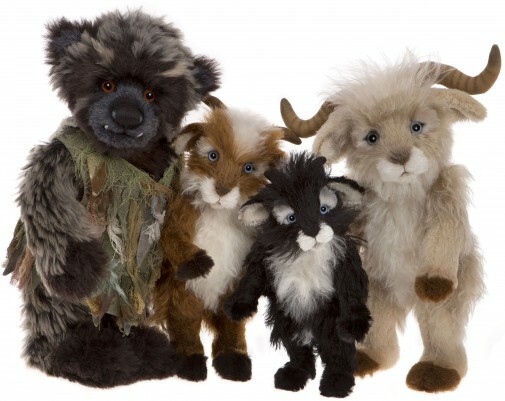 Billy Goats and Gruff are fully jointed goats and troll from the Charlie Bears 2017 Isabelle Collection.